Nightgaunt - ZineWiki - the history and culture of zines, independent media and the small press. 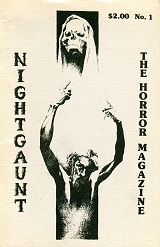 Nightgaunt was a literary horror zine edited and published by Bruce G. Hallenbeck from Valatie, New York, U.S.A. The first issue was released in Spring 1982. It contained fiction, nonfiction, and poetry. Contributors included Robert Bloch, Wes Cunningham, Stephen H. Donohue, Bruce G. Hallenbeck, Jeff Kahan, Chris Precious, and Serena. Cover art was by D.W. Miller. Interior illustrations were by Scott Donohue and Barry Knight. This page was last modified on 17 June 2012, at 20:15.